…ain’t that special. It’s not one of those banner years, like 18, when you get to vote, and can join the army. Or 21, when you wait until midnight the night before, then whip out your drivers license in the bar showing you are now of legal age to imbibe liquor. Why it’s okay to kill or be killed for your country at 18, but not have a beer, is one of those mysteries of society I will never understand. If I stretch my memory way back to the earliest birthday I can remember, I probably was 6. But, I also probably only remember it from the grainy 8 mm movies my dad took of the birthday party, and along with that, the distinctive sound and smell of the projector. The flap, flap, flap of the film at the end of the reel is a lost sound, recognized by us older folks, but unheard in the YouTube age. In the movie version of my birthday, the films of which lasted only about four minutes each, I was dressed in a cowboy costume, chasing other kids around, and sliding down the slide in our backyard. My cousins posed for the camera like glamorous stars. There was a nice birthday cake with six candles, far from the fire hazard I’d require today. The photo at left is me, far more mature, at the age of 12. Children are still very naive at that age, especially in the suburban setting in which I grew up. The worst that would happen was getting into a fight with one of my friends. A few punches were thrown, we’d go off and lick our wounds, then make up and get back to our usual cordial games. Not that I had not known grief. I had already experienced the assassination of President Kennedy. In fact, I saw him a few days before the fateful event, on a motorcade in Houston, where we lived at the time. I recall coming home from school to see my mother very upset, but not really understanding the importance. 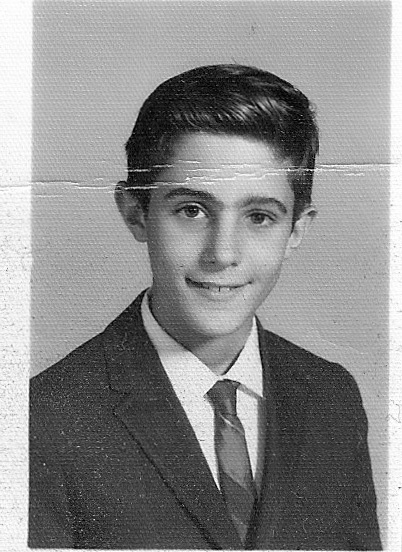 I was 9 at the time, three years before this photo. All of my close relatives were still alive, so I had not experienced death and loss. I did know something about World War II. My father had been in the Merchant Marine on an oil tanker that provided fuel oil for the battle ships and destroyers in the Atlantic and the Pacific. He didn’t speak much about the horrors of that war, but he related some stories of harrowing times under attack by German subs, when an escorting destroyer in his convoy was blown up. The image of sailors being blasted off the deck clearly made an impression on him, and I picked up some of the fear for their lives these men must have felt. As birthdays passed, I marched on to my 16th. Living in Arizona at the time, I was able to get a full, unrestricted driver’s license at that age. I believe the reason they allowed such young kids to get licenses in Arizona was that it was a lightly populated state, with many agricultural communities, and someone needed to be able to drive pops to the liquor store to stock up for the weekend. It made for an interesting singularity, though. We moved to California that year, and while the driving age there was officially 18, 17 and a 1/2 for a permit, they recognized my Arizona license and gave me a full license in California. I was the only kid my age in high school to have a license, which made me pretty special. While this held me until I was 18, the drinking age was 21 in California, but only 18 in Arizona. I took a road trip back to visit friends in Scottsdale when I was 19, and the first thing I wanted to do was get a drink in a bar. My experience with liquor to that point was very limited. I had sips of my grandfather’s beer from time to time, Rheingold, and my parents drank the cocktails of the day, the martini and manhattan. As a child and teen, my parents would have parties with the obligatory mixed drink cart, cigarettes in attractive boxes about the room, and fancy lighters which doubled as decorative accents. So, when I hit the bar with my friends in Arizona, I hardly knew what to order. I settled on a scotch on the rocks, having heard of that drink in a movie somewhere along the line. It burned my throat, and I don’t think I was able to finish it. Around this time, though we were still in the worst of it in Vietnam. Shocking photos from war journalists were making the cover of Time and Newsweek, and statistics of soldiers killed and wounded were broadcast on the news. I signed up for the draft as required, although my parents swore that if I was drafted we were headed for Canada. Oh, Canada, thanks for being there in our time of need. As it turned out, my birthday was given a high enough number in the draft lottery so I was not called up either year I was eligible. I’m not sure what I would have done if I was, probably try to join the Navy. After the second year of the draft, President Nixon ended our role in the “conflict”, and brought the soldiers home on March 27, 1973, forty years ago. The war between North and South Vietnam continued two more years, until the North, backed by China, had crushed the South. The Vietnam War was my awakening to the inhumanity possible in man against man. Women and infants slaughtered, because they might be abetting the enemy, and indiscriminate bombing and exfoliation of the jungle led to massive protests in the U.S., and many students who took part were injured or killed for doing so. When I started my college years at UCSD in 1972, the campus was still reeling from the May, 1970, self-immolation of George Winn, Jr, who was a graduate student at UCSD and was protesting the war. While terrorism hardly started in the 1960’s, it was in the late sixties and early seventies that the term terrorists seemed to become well known. Bruce Hoffman, a specialist in the study of terrorism at Georgetown University, defines terrorism to include several features including that it is conducted by an organization with an identifiable chain of command. His definition can be found in this Wikipedia article. Through college and medical school, birthdays seemed to fly by. No longer the cause for a gay party with balloons and cone hats, they more marked our stages of development as adults. At 25, one is considered old enough to be more responsible behind the wheel, and the auto insurance costs go down. At 29, one is on the verge of losing youth, and everyone seems to want to be 29 for a long, long time. Come 35, one should be married, have a job, and some kids. Work becomes an every day responsibility, as we take on the raising of children, the house mortgage and all the other obligations of becoming truly adult. While things were still happening around the world, some wonderful, like space shuttle trips to the space station, or the invention of the car phone (bit of a double edge sword, that), the world also was getting hotter with extremists and their attacks. Names such as the IRA, Shining Path, Cuban Hijackers, the Red Army Faction, the Unabomber, the PLO, Islamic Jihad, Armenians, Italians, Sikhs, and many others became front page news items for their atrocities. Yet, with a family to raise and a very busy work schedule as a young surgeon I was much more interested in my immediate circle. One slightly ironic note was that, as an attending at the V.A. Hospital, I found myself caring for Vietnam Vets whose lives were destroyed back in the 1960’s and 1970’s. I also took care of vets from the first Iraq war, Desert Storm. We go through stages as adults where we are at first very aware of what is going on in the world, and want to do something about it. We protest, join the peace corps, and are activists politically. Then, we knuckle down to raise a family, provide for the family, and deal with the everyday little problems that fill our world. As the children become independent adults, we again get more involved with what is going on in the world. The US has been lucky lately, situated where we are between two big oceans and two friendly neighbors north and south. We have not had the daily threats of violence experienced by those in the middle east, Europe, Asia and even South America. The attacks of 9/11 woke us up to the fact we are not immune to horrific terrorism, just rather well insulated. We also have had a large number of senseless home-grown attacks by gun wielding psychotics, or attacks like the Okalahoma City bombing in 1995, politically motivated but not from an organized anti-government force. 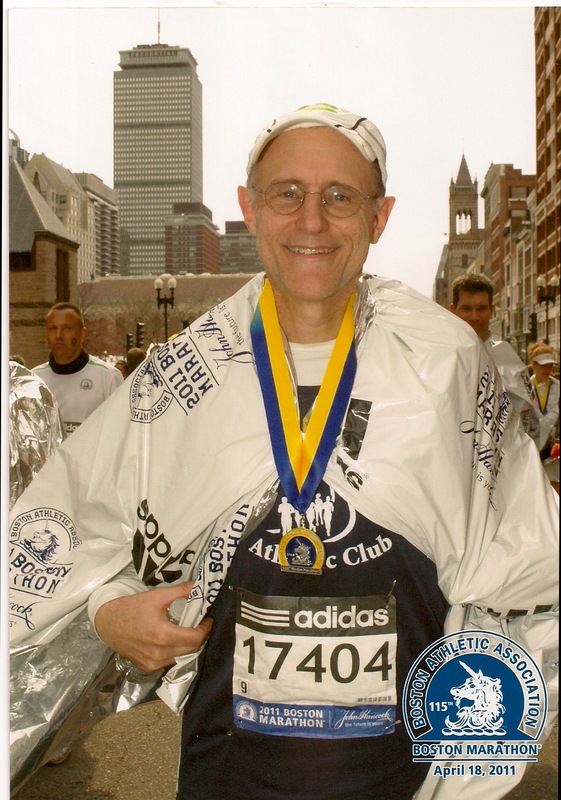 The Boston Marathon occurs a week, or at most almost two weeks, before my birthday. For me what this means is I will never run it at the peak power of my age group. I will always have to qualify for a year into that age group. As I’ve reached my 59th year, I can see that I no longer can run with the speed I had ten years ago. It doesn’t sound very old, 59, but the legs don’t lie. 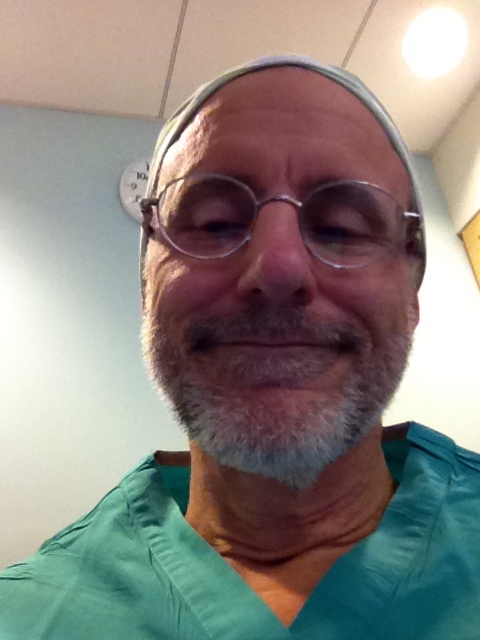 I had the humorous experience of seeing one of my patients of many years, perhaps twenty, in the office the other day. While she still looked fit, I thought to myself, “my, she seems so much older than I remember her when she first came to see me”. She must have caught wind of that thought, and said out loud, “you are really looking pretty old”. I laughed out loud, realizing we both must have been thinking the same, that we really have changed as we got into our late fifties. From inside my body looking out, I don’t feel old. In fact, I feel the way I perceived myself looking perhaps twenty years ago. But, take a look in the mirror, and that older individual looking back, the one I don’t recognize, is definitely me. The bombing at the Boston Marathon was such an awful, unexplainable attack, and when it happened, I found myself in shock. I was not there this year, but had very close friends there, many of whom would have been crossing the finish line within minutes of the bombs going off. It took quite some time before we back home found out that all of our friends were alive and had not been injured. I am so thankful for their sakes and for their worried families. The attack, though, seems not to have a thought behind it other than to be some kind of copycat attack. It is one thing for Chechens to want to attack Russians, who have politically dominated them, or for the IRA to lash out at the British. Inexcusable, and not productive, but the reason behind these attacks, or of myriad other terrorist attacks, is not mysterious. This incident must have had it’s intended consequence, to make us fear for our lives and limbs on a daily basis. But it does not carry forward any particular agenda and so becomes just a very awful, desperate and destructive act. I feel a little sorry for the young man who aided his brother and now has lived to face the punishment. In the picture that emerged of his pre-bombing life, he does not seem like someone hell-bent to cause pain and death. 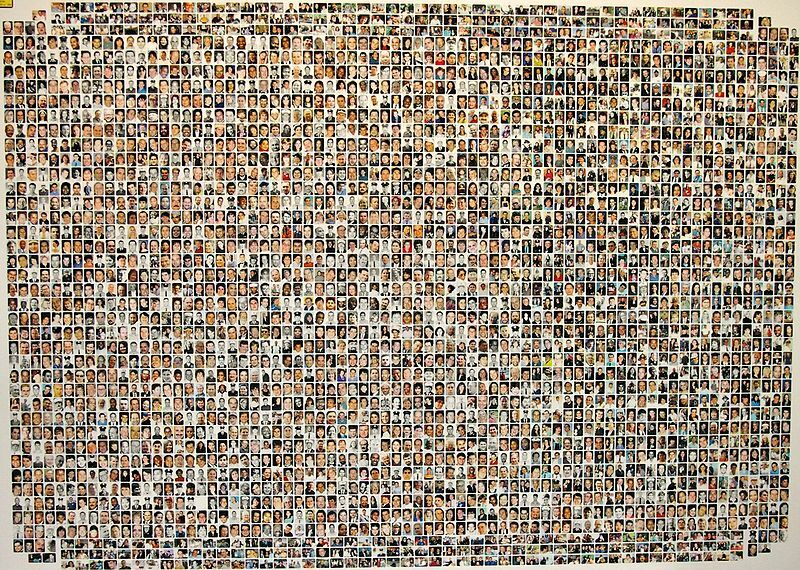 Nevertheless, I feel much greater sadness for the victims of his heinous crime, the families of those who died, and the ones whose limbs were blown off them, and who now must learn to live a completely new and more difficult life. Ultimately, running a marathon is a selfish act, but the outpouring of support one gets at the Boston Marathon shows that we runners have somehow given inspiration to those watching. I had many a spectator yelling support and cheering me on as I struggled to complete the course and get across the finish line. So today, on my 59th birthday, not relevant in the list of birthdays, but, for me, a time of reflection, I realize that what we do and say makes a difference. How we behave and comport ourselves sets an example for others to follow. If we are mean, and engage in cruel acts and torture, we are setting an example, not declaring some high ground as ours. While this incident was not the worst attack in recent history on US soil, it is for every individual killed or injured. I hope we as a country learn from it to be kind, to encourage and to support, not to take revenge and continue a cycle of destruction. Happy birthday, Frank! I have enjoyed all of your blog posts, but this is the most eloquent and powerful one yet. I hope for a more peaceful year, for all of us. Thanks, Dan. It means a lot to me that you read my blog. Thanks for your comment. good for your age you keep so damn busy you don’t have time to get old. Happy belated birthday speedy! I think you should have a gay party this year to celebrate. Happy birthday! Well said Frank! Happy Birthday! Thanks, Robert, and thanks for reading the blog. hey man looking for a new entry your readership demands it. Getting bored reading Faulkner want something interesting. I had trouble with Faulkner, too. Too many paragraph-long sentences. Anyway, you ask, I answer.